Cove and the Rosneath peninsula seen from Blairmore, on the Cowal peninsula, across Loch Long. Cove is a village on the south-west coast of the Rosneath peninsula, on Loch Long, in Argyll and Bute, West of Scotland. 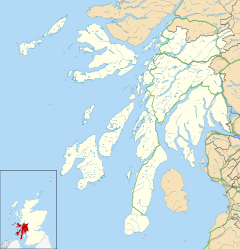 Historically in Dunbartonshire, before the local government reorganisation in Scotland in 1975 it formed part of the small Joint Burgh of Cove and Kilcreggan. It remained in Dumbarton District until 1996 when it was transferred to Argyll and Bute with the rest of the peninsula. In common with many villages in the area, Cove was home to wealthy Glasgow merchants and shipowners in the 19th and early 20th centuries. Several of the large houses have either been converted or have gone. Houses by Alexander "Greek" Thomson around Cove include: Craigrownie Castle, Glen Eden, Craig Ailey, Ferndean and Seymour Lodge, all dating from the 1850s. Hartfield was the summer residence of Lord Inverclyde and later became a YMCA hostel before its dereliction and demolition in the 1960s by Fraser Hamilton of Knockderry Farm. Craigrownie Parish Church serves the communities of Ardpeaton, Cove and Kilcreggan. ^ "Kilcreggan Feature Page on Undiscovered Scotland". Undiscoveredscotland.co.uk. Retrieved 2017-02-15. ^ "Sacred Scotland - Scotland's Churches Scheme". 2017-09-24. Wikimedia Commons has media related to Cove, Argyll and Bute.